I make no bones about the fact that Edinburgh is one of my favourite cities on earth. It hosts the Fringe, my favourite festival; it’s where I met my husband for the first time (over seven years ago now – wow! ); it’s the capital of my homeland; and the whole place just teems with history, culture and fun. Last weekend Matthew and I journeyed up to Edinburgh for a quick weekend, to attend a surprise party for our wonderful friend Matthew (well done on pulling it off Siobhán! ), catch up with our lovely friend Laura before she heads off on adventures abroad (so exciting!) and to recharge a little away from the city! One of the (many) great things about Edinburgh is that we can fly there direct from London City, our local airport as east Londoners! We popped over early on Saturday morning, and three short hours after leaving the house we were snug in Edinburgh Airport’s Wetherspoons tucking into a Scottish Breakfast. Because haggis. Suitable sated we hopped onto the Airlink bus into town. This is such a great way to get into the city – half an hour on a comfy bus with loads of luggage space (not that we needed it, being hand luggage only for this journey!) and free wifi. 1. It was rainy, dreich and cold. 2. We were both pretty shattered! A busy week and an early start were telling on us both. With this realised we popped into a nearby holstelry for tea, reading (me! ), and watching the Labour leadership contest results being revealed on the iPad (Matthew). We went to the bar of the hotel we were staying in as it was the closest – if you’re ever needing a place to stay in Edinburgh I’d really recommend The Angel’s Share. The bar we took shelter in was also where we enjoyed our breakfast on Sunday. So pretty, with an amazing selection of booze! A lovely place to while away a little time on a Saturday, and no doubt a great place to play of an evening. After a cuppa we went to meet Laura for lunch. When we said to her we’d chosen a hotel in the west end of the city she said she book us into Whighams Wine Cellars for lunch. Rather brilliantly as we emerged from the hotel bar we realised the lunch restaurant was….exactly next door! Serendipity. We met Laura and had a jolly good catch up over lunch and drinks. I’m so lucky to have a bevvy of friends with whom I can pick up the conversational baton straightaway, whether we’ve been apart a few hours or half a year. It was so good to catch up with the lovely Laura and I can’t wait to hear about all her adventures as she jets off. After a delightful and delicious hodgepodge lunch – mussels for Laura, steak pie for Matthew and nachos for me – we said our farewells and headed into the hotel to check in. The hotel has such a clever naming system for their rooms! Each room or suite is named after a famous Scot, from Sean Connery to Annie Lennox to Nicola Benedetti. 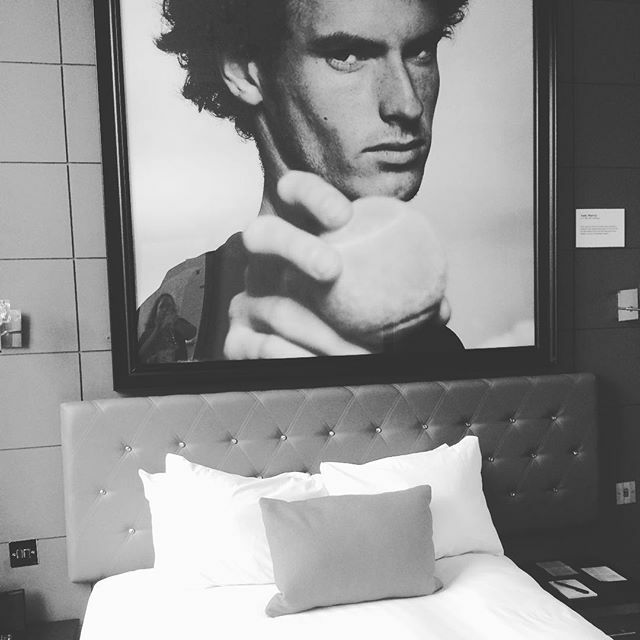 We were staying in the Andy Murray room on the third floor. That is a big portrait! Our room was quite small but perfectly formed, and ideal for a one night stay. I loved that alongside the usual tea and coffee making facilities you also got Tunnock’s Tea Cakes! After a wee sit and a change we headed over to the brilliantly named Woodland Creatures to toast Matthew and catch up with friends. I took way too few pictures but had a super time visiting and gossiping with good friends. We wussed out at about eleven and taxied back to our hotel. It had been a long, fun day! In the morning we arose and enjoyed another yummy breakfast before checking out – Edinburgh is bad for my waistline. After checking out we took a wee bimble along Princes Street, enjoying the views as it was fairly quiet at 11am on a Sunday. Love how the castle is so prominent as you walk through the city. We decided not to go on the Ferris wheel, even though it looked fun – I’m not always the best with heights! After a good wee leg-stretch we headed to All Bar One on George Street for a cuppa (I love that you get a shot glass of smarties with your tea! ), before heading back to the Airlink. There were a few minor delays at Edinburgh Airport (it was SO busy! ), but before long we were back on the flight back down south. When you spy the London Eye, you know you’re home! A lovely trip north – I felt rested and replenished, with the Scottish quota in me quite topped up, happy to have caught up with so many of my favourite people. Good times! Previous Post I LOVE your blog….